Comment: Holi at Banke Bihari Temple in Vrindavan is not just a festival in Vrindavan, its a celebration of life. Every year thousands of people throng to this beautiful town to celebrate Holi at the temple dedicated to Lord Krishna and play Holi with God himself. The tradition of Holi at the Banke Bihari Temple is also really interesting. It is believed that on the day of Holi, the almighty only sits and observes his devotees play Holi and himself does not participate in the festivities. So it's actually the day before the main Holi festival, that the temple comes alive when God himself actually plays Holi with his devotees. 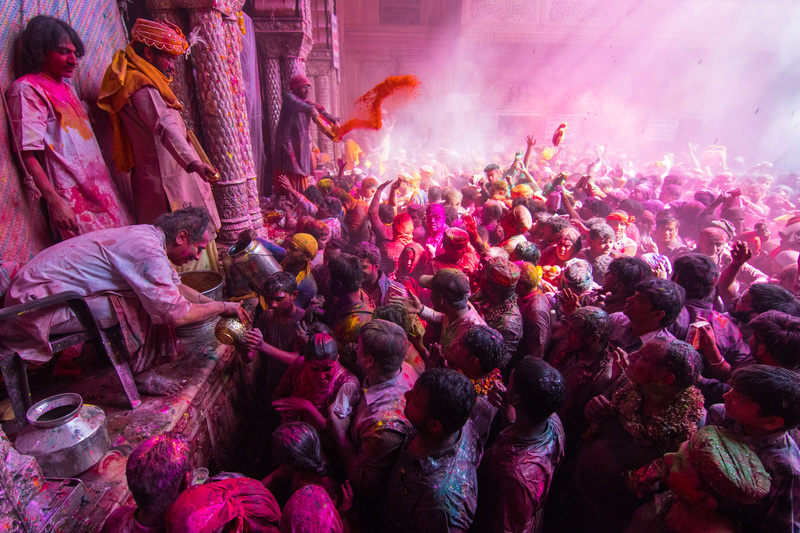 The priests spray holy water and colors and the devotees chant in unison.